Ascites diluted in PBS with 0.05% NaN3. Antigen is purified rabbit skeletal muscle sarcoplasmic reticulum. This antibody recognizes an epitope between amino acid residues 506 and the C-terminus of rabbit skeletal muscle ATPase, a region that is exposed in native sarcoplasmic reticulum. This product contains sodium azide as preservative. Although the amount of sodium azide is very small appropriate care must be taken when handling this product. SERCA1 antibody was raised in mouse using purified rabbit skeletal muscle sarcoplasmic reticulum as the immunogen. Small volumes of anti-SERCA1 antibody vial(s) may occasionally become entrapped in the seal of the product vial during shipment and storage. If necessary, briefly centrifuge the vial on a tabletop centrifuge to dislodge any liquid in the container`s cap. Certain products may require to ship with dry ice and additional dry ice fee may apply. 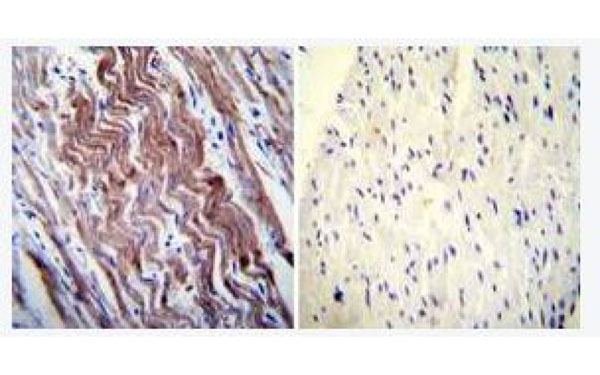 Immunohistochemistry was performed on normal deparaffinized Human heart tissue tissues. To expose target proteins, heat induced antigen retrieval was performed using 10mM sodium citrate (pH6.0) buffer, microwaved for 8-15 minutes. Following antigen retrieval tissues were blocked in 3% BSA-PBS for 30 minutes at room temperature. Tissues were probed at a dilution of 1:200 with SERCA1 antibody or without antibody (negative control) overnight at 4 deg C in a humidified chamber. Tissues were washed well with PBST and endogenous peroxidase activity was quenched with a peroxidase suppressor. Detection was performed using a biotin-conjugated secondary antibody and SA-HRP, followed by colorimetric detection using DAB. Tissues were counterstained with hematoxylin and prepped for mounting. NCBI/Uniprot data below describe general gene information for SERCA1. It may not necessarily be applicable to this product. This magnesium-dependent enzyme catalyzes the hydrolysis of ATP coupled with the transport of calcium.